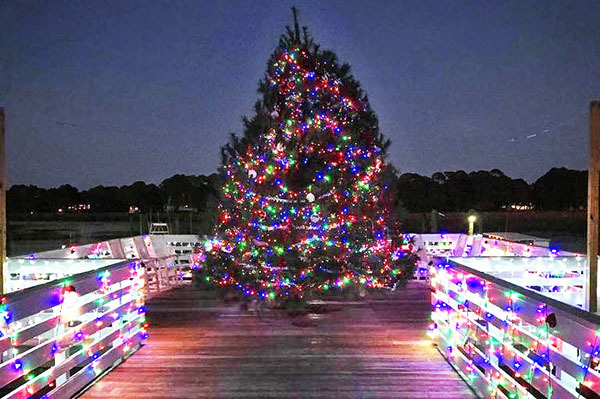 There are plenty of ways to get in the spirit of the holiday season here on Hilton Head Island! Whether it’s Santa or Christmas lights you want to see, you’ll find them and more this year in the Lowcountry, where Christmas parties, parades and lights take over and Santa strolls the oak lined streets spreading holiday cheer. Enjoy the lights! Stroll along the harbour and enjoy the illuminated seasonal figures, with the centerpiece of the display being a towering Christmas tree. Harbour Town is the perfect place to be this holiday season with live entertainment and activities. Make a difference. While you’re enjoying the holiday season, you can help Deep Well make a difference in someone else’s life, too. Bring a canned good or two, or a new unwrapped child’s toy and drop them in the “Well” by the Liberty Oak stage. Sponsors: The Shops in Harbour Town, Hargray, Crazy Crab, PSAV, The Greenery. 149 Lighthouse Rd. (843) 842-1979 or www.seapines.com. “Holiday Lights for Tis the Season” at Shelter Cove Towne Centre. Park your car and stroll through the Holiday lights. Enjoy the holiday lights all season long. (843) 686-3090 or www.sheltercovetownecentre.com. Christmas Village in South Beach! The fun starts the Friday after Thanksgiving! Experience the magic of the holiday season in the Lowcountry. – Unbeatable lowcountry Christmas lights display – Write letters to Santa – Tasty Holiday Treats and Specials – Pictures with Santa – Families, children and well-behaved, leashed pets are invited to get their picture with Santa! Saturdays from 3-5 p.m. at the South Beach Inn Celebrate the Season with your favorite Salty Dog Crew! South Beach Marina Village in The Sea Pines Resort, 232 S. Sea Pines Dr. (843) 363-2198 or www.saltydog.com. Families are welcome in the lobby of South Beach Inn & Vacation Rentals for free pictures with Santa from 3-5 p.m. For more information, call South Beach Inn & Vacation Rentals, 232 South Sea Pines Dr., at (843) 671-6498 or go to www.sbinn.com. Santa Claus in coming to town at the Tanger Outlets. Mark your list and check it twice because Santa is coming to the Tanger Outlets-Hilton Head! Children of all ages are invited to meet Santa each Saturday from 10 a.m.-4 p.m. in the winter wonderland workshop. 1414 & 1256 Fording Island Rd. (843) 836-5410 or www.tangeroutlet.com/hiltonhead/events/december. Hilton Head Preparatory School presents Festival of Trees at the Sonesta Resort in Shipyard Plantation. It’s the most wonderful time of the year! Please join us for our annual Festival of Trees event taking place at the Sonesta Resort! We will display beautiful Christmas trees and décor that will be available for purchase. www.hhprep.org. Join Boys & Girls Club of Hilton Head Island for our 18th Annual Golf & Tennis Tournament benefiting Boys & Girls Club of Hilton Head Island. 8 a.m. Registration for Golf is at 8 a.m. and the Shot Gun Start is at 9:30 a.m. Registration for Tennis is at 10:30 a.m. and starts at 11:30 a.m. Lunch Buffet following the tournaments (approximately 2 p.m.). $100 Vacation Package Drawing Tickets (limited to 250 tickets to be sold). Sea Pines Country Club, 30 Governors Rd. Click here to register and pay. Watch a showing of the movie, “The Santa Clause” under the Liberty Oak in Harbour Town. Benches and a fire pit for roasting marshmallows will be provided. Admission is complimentary with the donation of a canned food item for the Deep Well Project. 7-9 p.m. 149 Lighthouse Rd. (843) 842-1979 or www.seapines.com. The Heritage Library invites you to experience the magic of Christmas with Colonial Flair including period costumes, music, games and decor at the Zion Chapel of Ease History Park. Two shows, 10 a.m.-noon and 2-4 p.m. $10 per person, Children under 12, free. www.heritagelib.org. Please join us for the Annual Town of Bluffton Christmas Parade. You can register for the parade by clicking the link below. The parade begins at 10 a.m. Streets will begin closing at 8 a.m. The parade ends at Red Cedar Elementary school. Thank you and we look forward to seeing you at the parade! Call (843) 706-4500 or go to www.townofbluffton.sc.gov. The Hilton Head Symphony Orchestra presents “Twas The Night Before Christmas” at First Presbyterian Church, 540 William Hilton Parkway. A holiday spectacular with John Morris Russell featuring all your festive holiday favorites, our HHSO Chorus, and the 2018 HHSO Youth Concerto Competition Winner, Maggie Kasinger. For more information, call the Hilton Head Symphony Orchestra at (843) 842-2055 or visit their website, www.hhso.org. 5th Anniversary Celebration Of The Toni Morrison Bench In Mitchelville Big Oak Tree. 5:30-6:30 p.m. Free admission includes light refreshments. Donations accepted. Historic Mitchelville Freedom Park, 229 Beach City Rd. (843) 255-7301 or www.exploremitchelville.org. The Winter Wonderland Festival will be held at Shelter Cove Community Park from 4-8 pm. There will be hayrides, carnival games, petting zoo, children’s parade, and much more. Santa and Mrs. Claus will also make an appearance. The festival is a safe environment for parents and children to begin their holiday season. The age recommendation is 3-12, but everyone is welcome to attend. Admission is free but donations are always welcomed. Concessions, trampoline, bungee, and rock wall sold separately. 39 Shelter Cove Ln. (843) 681-7272 or www.islandreccenter.org. The Coastal Discovery Museum has announced a sweetgrass wreath making class from 10:30 a.m.-12:30 p.m. A local 7th generation Gullah basket maker will teach this special holiday class and you’ll have a chance to make a decorative Sweetgrass wreath on your own using locally found natural materials. You will hear the history of the Sweetgrass basket, one of the Lowcountry’s best known art forms. The class is $65 per person and reservations are required by calling (843) 689-6767 ext. 223. 70 Honey Horn Dr. www.coastaldiscovery.org. Watch a showing of the movie, “The Polar Express” under the Liberty Oak in Harbour Town. Benches and a fire pit for roasting marshmallows will be provided. Admission is complimentary with the donation of a canned food item for the Deep Well Project. 7-9 p.m. 149 Lighthouse Rd. (843) 842-1979 or www.seapines.com. Hilton Head Shore Notes Chorus Christmas Show at Island Lutheran Church, 4400 Main St. 2:30 p.m. $10 Adults, $5 Children under 12. (843) 705-6852 for ticket information or www.hiltonheadshorenotes.com. Christmas Party with The Headliners hosted by the Hilton Head Island Carolina Shag Club at Country Club of Hilton Head, 70 Skull Creek Dr. 6-9:30 p.m. www.hiltonheadshagclub.com. “Christmas in the South!” Our Christmas in the South holiday concert is filled with traditional tunes and carols with a distinctively southern accent. Always a family favorite on Hilton Head Island, this concert has a sleigh-full of musical treats and treasures to put you in the holiday spirit. Merry Christmas, Y’all! 8 p.m. Purchase concert tickets easily with our online ticketing system. If you need help call our box office at (843) 341-3818 to place your order. All seats are reserved. Depending on availability, you may purchase tickets at the door. First Presbyterian Church, 540 William Hilton Pkwy. www.hiltonheadchoralsociety.org. Cookies, Cocoa and Santa Oh My! Come join the Sandbox Interactive Children’s Museum for some spirit of the season with an Elf Workshop (holiday crafts), the Sugar Plum Stop (cookie/treat decorating) and Hot Cocoa on the porch. Event admission is $5 for Adults, $10 for Children, up to 12 months is free. Members are free. First come, first serve. Space and activities limited in the event of rain (Sorry, coupons not valid for special event). www.thesandbox.org. Relish the spirit of the holidays with an evening in Harbour Town. Listen as Gregg Russell plays his guitar and sings songs of the season for children and adults. Before and after the concert, enjoy a special visit from Santa Claus 5:30-7:30 p.m. and 9 p.m. Complimentary! For more information, (843) 842-1979 or www.seapines.com. The 27th Annual Hilton Head Hospital Jingle Jingle 5K Run and Health Walk is 9 a.m. on and around the Hilton Head Hospital Campus and Main Street. The Hilton Head Hospital Jingle Jingle 5K Run features a colorful seasonal theme and provides participants a chance to burn off those extra holiday calories. The Jingle Jingle Run features all standard male and female running divisions. Holiday prizes are presented to the top three overall male and female finishers, plus the top three in each age category will also receive unique holiday awards. We also have a free Kids Fun Run for children under 6 years old. The first 500 participants in the 5K will receive a long-sleeved Jingle Jingle t-shirt, jingle bells, and a candy cane. An festive award ceremony featuring a visit from Santa, refreshments, music, hot coco, cider and door prizes will be held following the race. For more information or to register visit www.bearfootsports.com or call Bear Foot Sports at (843) 757-8520. Show your adventurous side with the other “polar bears” by taking an invigorating dip in the Harbour Town Pool on a chilly winter day. 10 a.m. Warm up after your plunge with hot chocolate and refreshments. Complimentary! (843) 842-1979 or www.seapines.com. Want to celebrate the New Year without staying up to midnight? Then ring in 2019 with your family at The Sandbox! Festivities include special games and activities both indoors and outdoors. In addition to scavenger hunts, games, fun arts & crafts and a picnic lunch, attendees will ring in 2019 with party favors and a balloon drop at 12 noon. Event admission is $5 for members, $10 for non-members. Military and senior discounts are available. First come, first serve. Space and activities limited in the event of rain. (Sorry, coupons not valid for special event). www.thesandbox.org. New Year’s Eve Celebration! Join us for a festive New Year’s Eve ball drop from the top of the Harbour Town Lighthouse! Enjoy food, fun, entertainment and live music throughout Harbour Town, then count down the ball drop as we welcome the new year! There will be two drops: 7 p.m. and midnight. (843) 842-1979 or www.seapines.com.